Sometimes, finding a suitable recipient for our donations can be difficult and problematic due to distance/ language and various other factors. When you stumble across a suitable charity in Lima that is actually UK based, everything suddenly becomes a lot easier to organise and agree upon. And so, as it turned out, arrangements for our furthest every donation (Approx. 6256 miles), our first donation south of the equator and our first in South America started with a 30 mile drive to Guildford to meet Carole & David, founders of Project Peru. 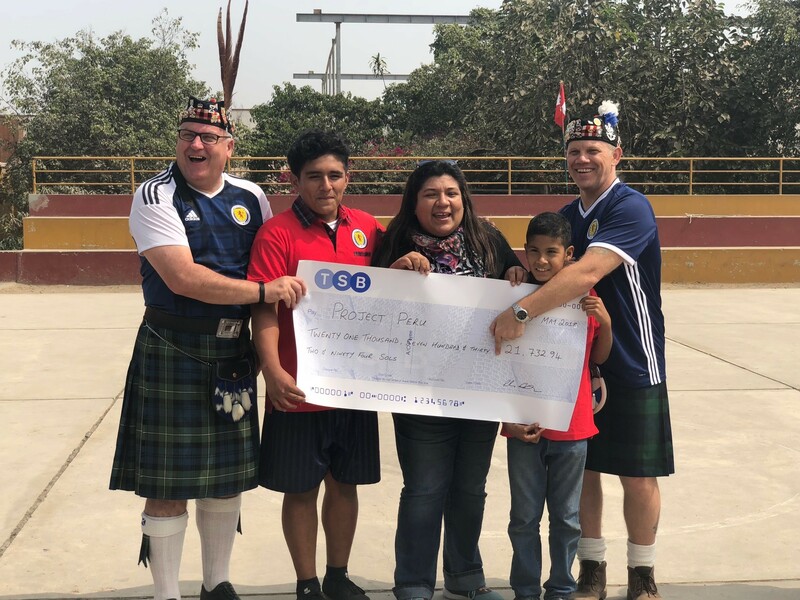 Project Peru is a small UK based charity that runs a refuge in Zapallal, a desert shanty town on the outskirts of Lima. The refuge offers food, clothes, shelter, education, health & fun to the 50 children who live there. The Refuge also gives ongoing & practical support to those who live in extreme poverty in the local community. Along with members of the Steering group, we were joined by 8 members of the Tartan Army attending their first Sunshine Appeal presentation. This is important to us as it allows those who support us the chance to see for themselves exactly what we do with all the money we raise. 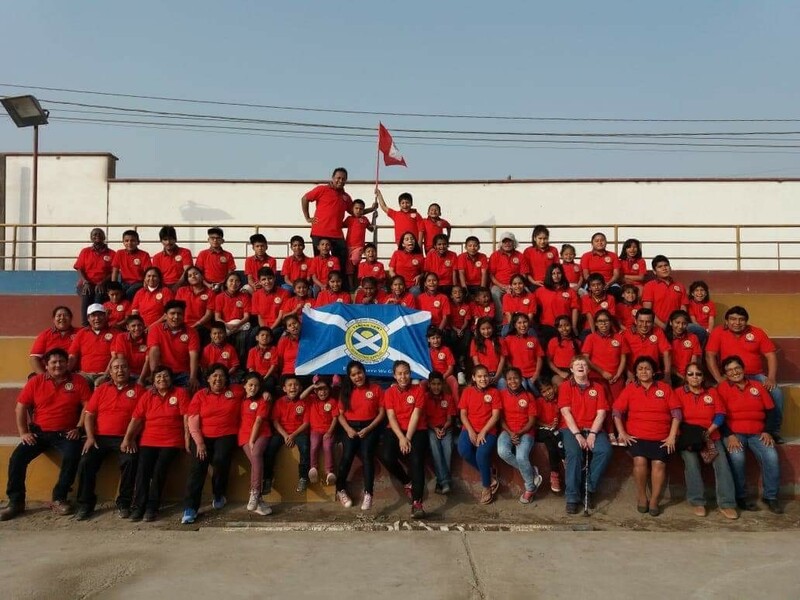 When we arrived at the refuge & met Karina, the door was opened for us to enter to be greeted by 50 kids all wanting to say hello, high 5 us and welcome us to Project Peru – It was a fantastic welcome! Next, we were challenged to a game of football. The kids playing disappeared to get ready – I swear the kids that came back out were not the same size as the kids that went to get changed! After a hard fought match, John Daly declared their ‘goal’ as being offside so it ended 0-0 and our unbeaten record remains intact for another few months at least! The staff at the refuge had been up early preparing a traditional Pachamanca – which means “earth oven” and translates to a big hole dug in the ground that cooks an entire meal over pre-heated rocks. Once we had seen this and whilst the staff were preparing lunch, Karina took us for a tour of the refuge. Her enthusiasm and drive to do what’s right for these kids was there for all to see. Even talking through our translator, Matt, none of her passion, values and beliefs were lost and it got quite emotional hearing the background some of the kids had come from. The refuge is an impressive place and everything is done for the benefit of the children there to help them grow, learn and become strong, independent young adults. The presentation took place where we donated 21,732 Sols (£5000) to Karina. Our financial officer almost had a heart attack as I’d forgotten to score out the £ sign on the cheque – Sorry John! We also donated 120 SSC members polo shirts to the refuge, enough for every kid to have 2 each and all the staff to receive one too. 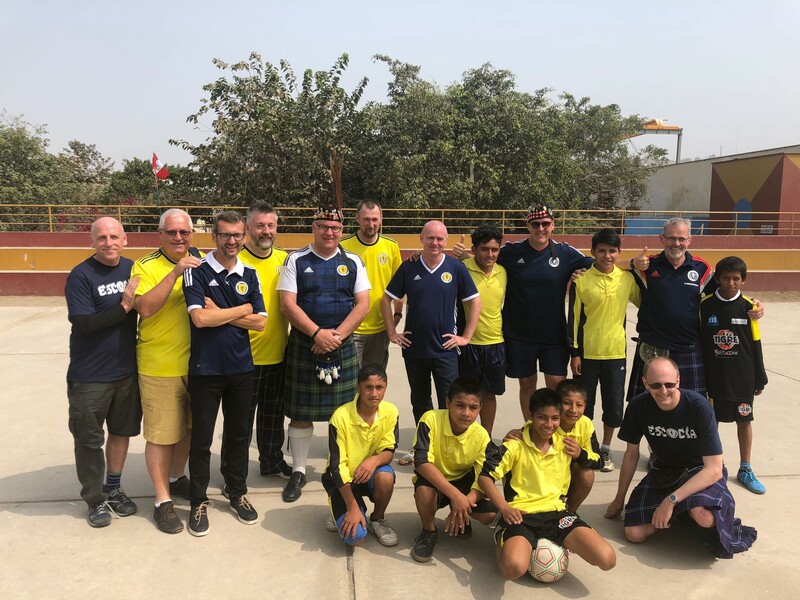 At this point a special thank you needs to go to Anne Marie Bannon at the SSC for sorting this out for us and to David Gibson at the SFA who arranged for transportation of the shirts along with the team kit to Lima. I’m proud to say we’ve left a wee bit of home in Lima! After a quick lunch it was time to say goodbye to everyone. It was a memorable visit for us all and to hear the comments of those attending their first presentation makes everything we do all the more worthwhile.